unfortunately our master bathroom isn't very stylish. it's still got original 80's interior, the kind that i think wasn't even cool at the time. so i can't even label it 'retro look' and try to fool myself into thinking it's everybody's dream to have a master bathroom like ours. i've not done much to the room in the field of interior design and decoration since we moved here. the only thing i did do is hang some hand crafted wire fishes and some other wire sea creatures on the wall, i think they look pretty cute there, giving the room some personal and artsy touch. 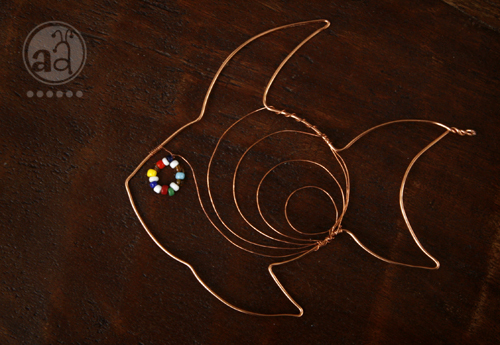 one of my favorite fish designs i came up with is this somewhat abstract one pictured above, you can find it in our shop. do you also have those rooms in your house that need a serious makeover... but since they're still functional didn't get the needed attention yet? You are one talented woman Simona! The fish is adorable. You truly are talented, but you know, ever time I see some wire, I always think of that phrase "NO MORE WIRE HANGERS" ... I'm officially weird. ::sigh:: I wish I had your vision when it comes to creating! Very cute fishy. Do I have rooms that need a makeover? I have an entire house!! Our house was in "move in" condition four years ago, but dated - we just haven't had the time (or the energy or the funds) to do much with it. Unfortunately, even slapping up a coat of paint is a challenge for me!